Nadur is spread over the top of a tale-flat hill. It’s name is most appropriate as it means to “keep guard”. Overlooking the little bay of Dahlet Qorrot, Ta'Sopu Tower was built for this purpose in 1667, however in 1798 French troops still managed to make a landing in Gozo at an area known as Ta'Venuta, a location close to Ta'Sopu Tower, but unfortunately out of its range. The restored Ta'Kenuna Tower, is used for artistic exhibitions and was built in 1848 by the British to serve as a telegraph link between Gozo and Malta. On the Rabat – Nadur road, one finds the Gozo horse-racing track and the Gozo scrambling track. The best way to Ramla Bay is by this road. Beyond the village school the road leads to fertile Wied San Blas and Dahlet Qorrot Bay. On the Nadur – Qala road an area known as il-Buskett, once a very wooded area, was the venue of the traditional feast of l-Imnarja, the feast of St. Peter and St. Paul, to whom the parish is dedicated. On the eve of the 29the of June, people used to gather in the area to spend the night barbecuing rabbits and singing to the accompaniment of guitars. The monumental church of the Saints Peter and Paul was begun in 1760, however the façade and aisles were built at the beginning of the 20th century. The church is entirely covered in marble and has also a pulpit sculpted in marble. 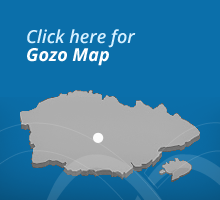 The Gozo Maritime Museum is just off the village square.